Happy Sunday, my loves! 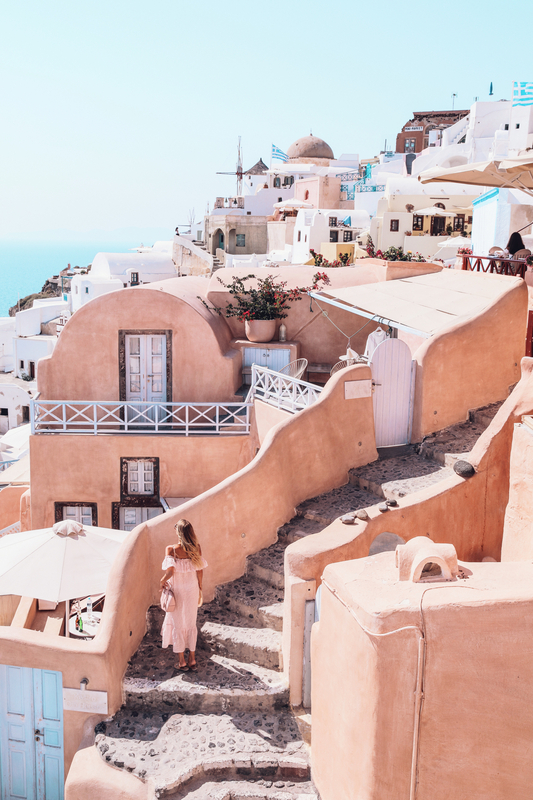 Today I’m finally sharing with you some of my most loved pictures Alex and I took during our three short but amazing days on Santorini. 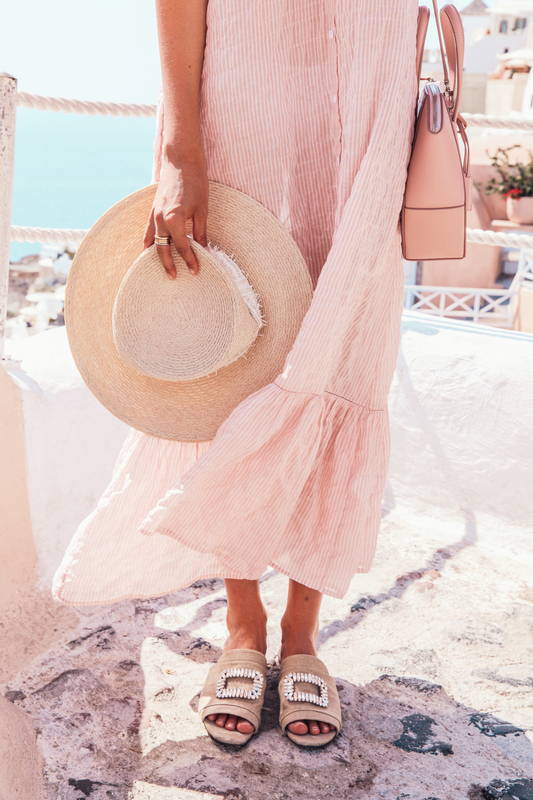 Even though it was a super hot and crazily windy day (well, it’s not the messy hair style of the day, it was the wind ;)), I was keen on shooting my outfit in one of my favorite places in Oia. This spot is close to the sunset view point, but during the day you can find times when the place is free of tourists! Though I have to admit that the colors are even more beautiful when the sun is going down, changing this pastel colored place in an even more colorful wonderland. 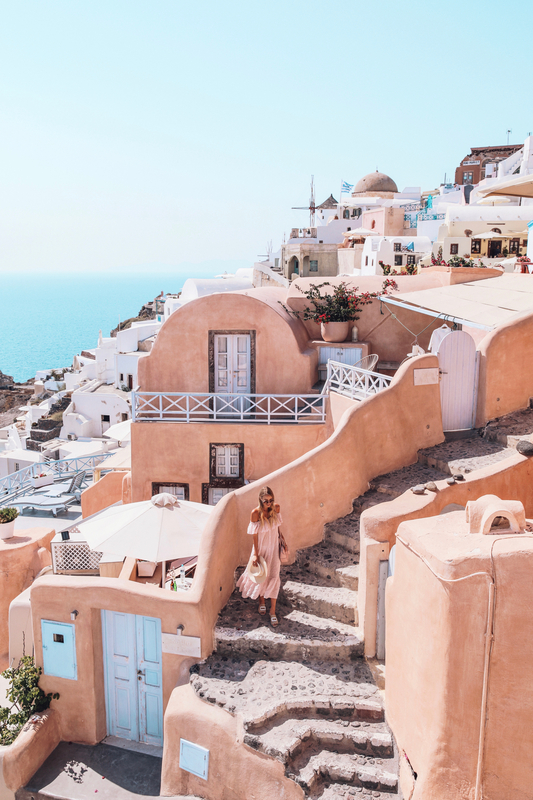 I have to say that although I’ve been to Santorini three times and I’ve seen this particular place over and over again, it still seems unreal to me… I was wearing a slightly transparent Lisa Marie Fernandez dress which is part of my Net-A-Porter summer wardrobe – Find all summer dresses: here. 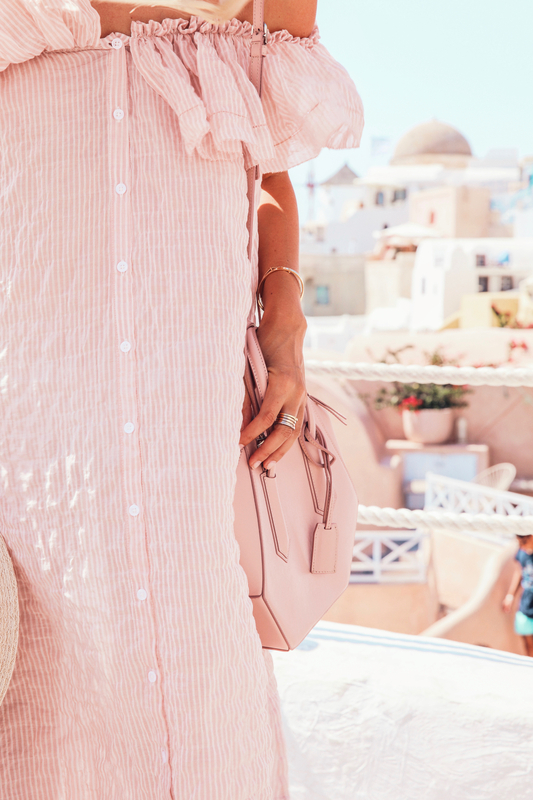 Selecting my Net-A-Porter favorites for the summer months always makes my heart beats faster and when I unwrapped the light pink off shoulder dress I was almost sure I’ve died and came back to life in form of a dress! 😛 I combined my Roger Vivier flats (yes, I’m obsessed and they are also very comfortable which has been a plus, plus, PLUS for Santorini! ), Eugenia Kim hat and my fav round Chloé sunnies. I bought the sunnies last year at Mister Spex and I’ve been taking them to all my travels ever since because I never get enough of this retro chic meets Chloé girl vibes! To bring in a little more pink, I added my Sage Aubrey bag. You are looking like a doll here! LOVE your dress and bag! So ein tolles Kleid und ich liebe einfach diese Sonnenbrille an dir! 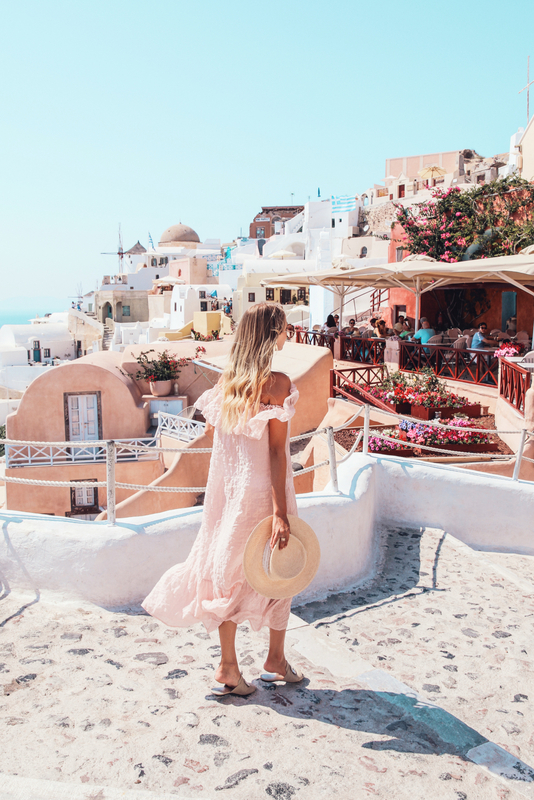 Wow, nach jedem deiner Santorini-Posts bekomme ich noch mehr Fernweh*-* Zum Glück beginnen meine Sommerferien in einer Woche…. Dein Look und die Bilder sind einfach nur traumhaft! Wow, die Bilder sind wirklich ein Traum und dein Outfit passt so schön zur Location! Wirklich toll! I was super dazzled by this photos. ? Absolutely stunning! The surroundings fit perfectly with ur outfit! You blog gives me so much inspiration! I love your style and feel like you are truly a kind person from your social media and the way you write! I hope to find this beautiful place too when we visit! Thanks for sharing! Das Kleid ist so schön und wie passend die Location doch ist. 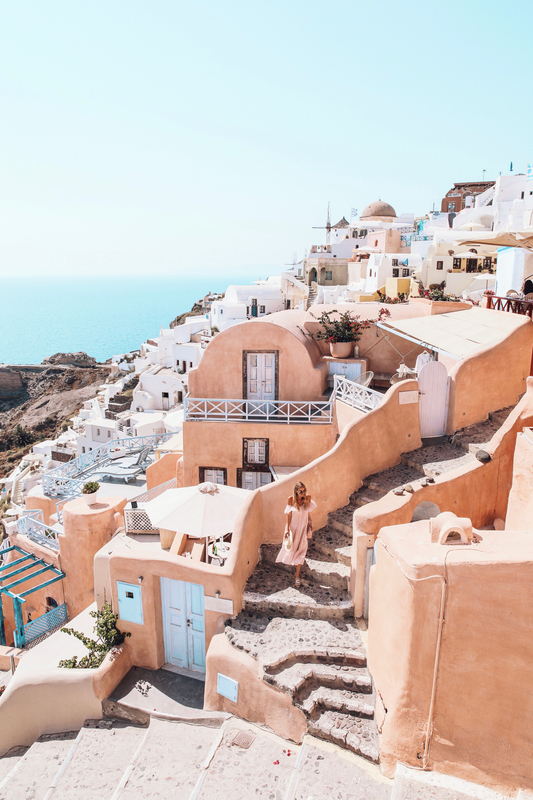 Santorini is on my travel list as well as all Greece. You look amazing! This dress was definitely made for you, Leonie! 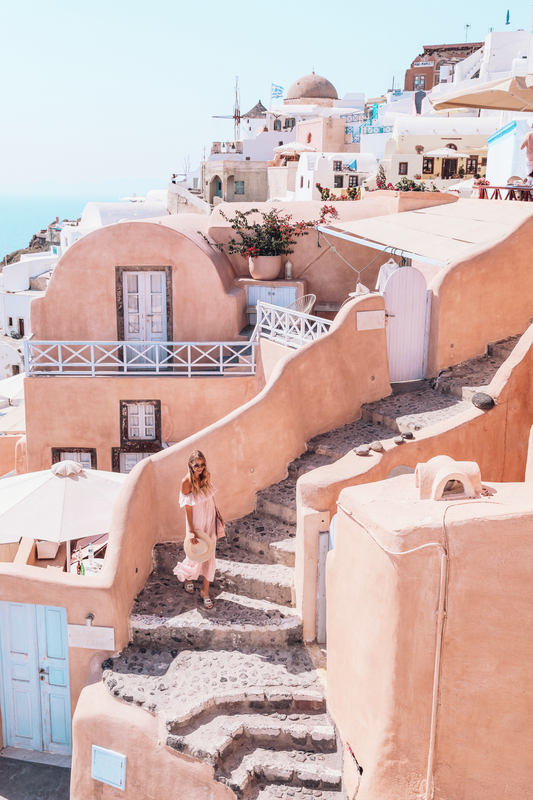 It’s so feminine and perfect <3 I really wanted to visit Santorini this summer but I have to admit I was put off by the number of tourists that there would be. But from your post, it's really nice to know that you can still find some quiet moments there. I'm not going to give up on Santorini just yet! Das Kleid ist wunderschön und die Bilder wie immer perfekt! Love these pictures! The dress is gorgeous! This dress is stunning, you style everything perfectly! Wow mega schöne fotos, sooo schön! OMG that dress!!! <3 Love these photos, although your pictures are always so amazing, but the color palette in this post is really beautiful. Die Location ist einfach wahnsinnig schön und dein Look gefällt mir sehr gut. Those Chloe sunnies are like your signature sigh <3 Love it! I totally vibe with you style ?? Wie immer ein super schöner Post.